@chess: It depends on where you work. The state pays $50/day after the first 3 days. some employers and unions will pay the rest of the jurors salary, others do not. Wonder what the total of expended Rounds per weapon is. And will it be revealed? 60 of these to go through, Then bring in the 2nd CSI to cover 61-123. Amazing amount of spent cartridges just imagine if the ar115 had not jammed. All this is doing is Validating all the evidence that is used vs JH. Not pretty but it is a must do thing. Photo's show where it was collected. Then they have each and every round in evidence. Just for those that are wondering why they are doing all this. the jury will either find him guilty, not guilty or not guilty by reason of insanity. just because he confessed doesn't mean he's automatically guilty of all counts. that's why we're here. Somewhere there is a drawing of the entire Theater That will have each Exhibit number showing where each and every item was located. Dunno if they will show that in the trial. @Phil. Is there a count of how many ppl were actually in theater 9 in addition to the 10 & 70? will be interesting to see if Pearson asks him at the end for the totals of rounds by type that he collected. 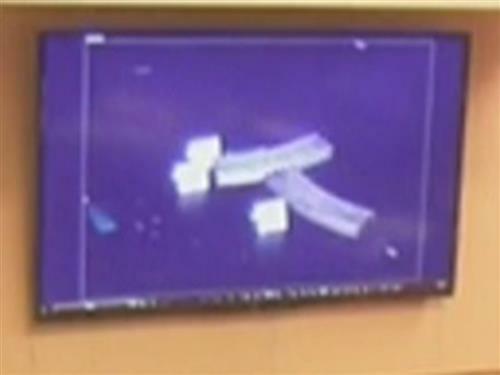 Nick Carroll: Now explaining photos of where he found the loaded gun magazines. Several so far. 39 unfired rounds removed from a magazine Nick Carroll says. If she does ask that, Spengler will object saying Cumulative, Yes it is, It's an accumulation of how many rounds he fired. Carroll and staff removed the live rounds from the magazines after they were collected. This one contained 39. He held them up in court. I think the theater had 400 seats, but even if it was sold out, there were a few empty seats because JH bought tickets at the kiosk, trying to get a ticket that had theater 9 on it. He kept buying a ticket at different times until he got theater 9. 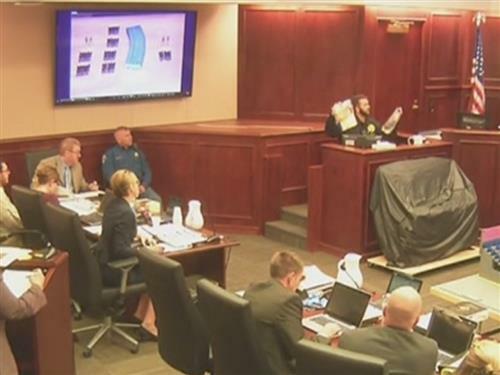 Were the 39 unfired rounds from the gun inside the theater? @Kristle: From a magazine... just one of several. @Phil, Do you know who the lead attorneys are for each side? Objection to evidence is overruled and the evidence is admitted. Great point on GB. I suspected King was the other lead, He sits back and is working on The next eventuality. @Phil, I have nothing today so far, This is the cut and dried mundane Evidence stage. If anything he could put it in his own way. Drum style gun magazine photographed. Several un-fired rounds. OK which gun is using the Drum magazine, I am assuming the shotgun. @NT8: The rifle. We've heard it jammed. That is why so many magazines were found still loaded. He allegedly tried them, but abandoned them. @Phil, The rifle used the cartridge magazines I thought. @NT8 the AK uses the drum magazine. @docJ, They have to do this inorder to make all the evidence collected Valid. No way around it. how come he is able to present all of the evidence that his colleague cataloged? or did i misunderstand? i thought he said he did 1-60 and someone else did the rest..